Starlings - "Sturnus Vulgaris" - about to descend to their roost , in a conifer wood , south of Dudwell Mountain . Starlings feed many miles from their Winter Roost , returning at sundown, sometimes giving fantastic aerial displays ( murmuration ). 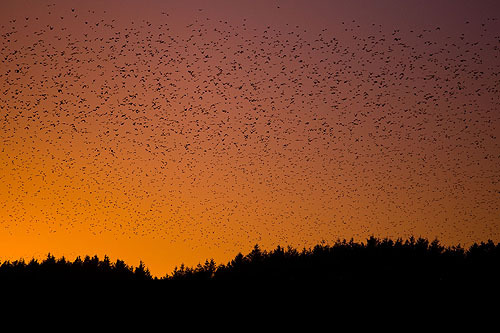 By mid march the winter roosts have broken up , the migrants returning to their breeding grounds and residents down to small breeding flocks .